AFTER two years of talks, the proposals for a progressive wage model for the security industry are finally drawn - and accepted by the government. But it will be another two years before workers in the industry see their pay, careers and working conditions improve. A key proposal made by the NTUC-led Security Tripartite Cluster (STC), the architect of the model, is the mandatory requirement for security agencies to embrace the progressive wage model (PWM) when applying or renewing a licence to operate. The government says this will take effect only from Sept 1 , 2016. This is to give the industry lead time to comply with the PWM training and wages requirements, said a joint statement issued on Wednesday by the Ministry of Home Affairs, Ministry of Manpower, Workforce Development Agency and Singapore Police Force. It also said that as the PWM will apply to security officers deployed under new and existing service contracts starting Sept 1, security agencies and service buyers are encouraged to factor in any anticipated cost hikes when they tender for or renew contracts. According to the statement, the Police Licensing and Regulatory Department will incorporate the PWM in its existing licensing framework for security agencies. Because this framework is already in place, Zainal Sapari, a union leader and member of the STC, said at a media briefing on Wednesday that there is no need for legislation, as it was done when the PWM was introduced in the cleaning industry early this year. The cleaning business did not have a licensing requirement then, according to him. 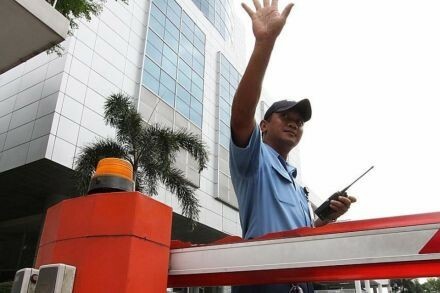 Like what they did for cleaners, the PWM for the security sector set a minimum pay - S$1,100 monthly - for security officers and this will rise to S$1,700 or more as the security officers upgrade and move up to a senior security supervisor level. Some 33,000 security officers are tipped to see a more than 30 per cent jump in their basic wage in a new five-level career progression plan under the PWM. Security officers at the entry level earn between S$700 and S$900 under the existing basic wage structure. Another key recommendation of the STC is to reduce the excessive working hours of security officers from a six-day to a five/six-day week and from some 95 overtime hours monthly to 72 hours set in the Employment Act. But the STC said that it would only consider in 2017 recommending an end to overtime exemptions "after carefully monitoring industry movements, changes in shift patterns and streamlining of manpower requirements, which may take place in the next two to three years due to the implementation of PWM". Adopting the PWM will translate to higher costs for employers of security officers, according to Daisy Chan, group chief human resource officer at Comfort Delgro. "But with more motivated and more alert security officers, we would have achieved what we want," she said at Wednesday's media briefing. While seeking to raise the wages and welfare of security officers, who are under-paid and over-worked, the PWM also provides for skills upgrading, career advancement and productivity improvements of these workers. "Having a PWM for the security industry benefits all stakeholders," the STC said. "With higher wages, security officers will have the option of better work-life balance through working fewer overtime hours, which in turn reduces fatigue and increases vigilance and performance." The industry, which is facing a chronic shortage of workers, will also be better placed to attract and retain well-trained security officers, it indicated. "The current heavy reliance on overtime hours (to meet market demand) is deleterious and unsustainable," the STC said. "It discourages potential job seekers from joining and staying in the security industry, which worsens the manpower shortage situation."